The only thing better than cheese is melted cheese. Place grated cheese and pepper strips in a clay bowl designed to cook at high temperatures and grill for five to seven minutes. Dip into the gooey goodness with traditional chips or tortillas. Tender, fall-off-the-bone ribs are a grilling classic. 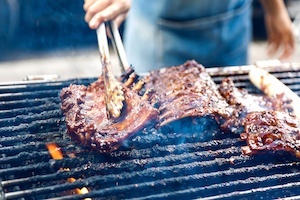 Add a twist with a barbecue sauce that includes cola for a surprising and unexpected hint of sweetness. The popular Food Network recipe also calls for a zesty dry rub made with chili, onion and garlic powders along with cumin and brown sugar. The grill serves double duty for this mouthwatering dish. Salmon is one of the varieties of fish that's best suited for grilling, and it's loaded with omega-3 fatty acids that make it a heart-healthy treat. Grilling also brings out the natural sweetness in many fruits, especially the peaches in this salsa. Are you incorporating more meatless meals in your diet? The quinoa in this salad provides a great source of protein, while scallions, mint, leeks and arugula bring a touch of spring. Although it's a salad, the dish is filling enough to serve as a light entrée. Grilled pasta? Who knew? In this no-bake version of the Italian favorite, simply grill parboiled lasagna noodles until they blister, then layer with tomato sauce and feta cheese. Barbecue brunch? Yes, please! But this French toast is so flavorful that you'll want to enjoy it any time of day. If you want to add even more richness, use brioche or challah instead of regular white bread. This side dish is ridiculously easy to make, but it tastes like it came off the menu of a four-star restaurant. Start by grilling halved avocados and lemons cut-side down. Top the avocados with a mix of your favorite herbs and chopped nuts along with sliced cherry tomatoes. Finish with a drizzle of juice from the lemon halves. S'mores are so twentieth century. Kids will feel like they're at the state fair when they bite into these grilled tortillas stuffed with their favorite candy bars and sealed with a dollop of marshmallow fluff. Be sure to prepare enough for mom and dad to join in the fun! What will you cook up on our Springs outdoor grills this season? Share your ideas in the comments!